The stimulus: This is the question or statement that poses a problem and stimulates thinking and information retrieval. 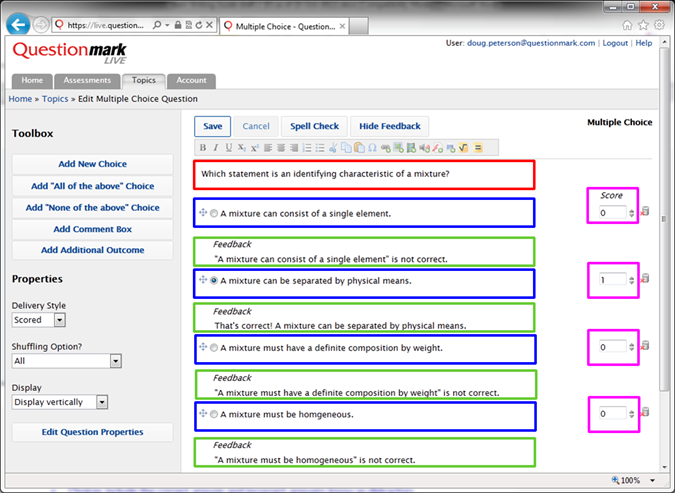 Choices: These are the possible responses that the learner uses to answer the question posed by the stimulus. Choices include the correct answer, and incorrect answers know as distracters. The score for each choice. Optionally, feedback can be inserted to provide guidance to a learner. A well-written stimulus is worded carefully to be clear and concise. Use common words and avoid jargon, although technical terminology is acceptable if understanding that terminology is part of what the assessment is testing. Always phrase questions in a positive way by avoiding words like “no”, “not”, or “never”. Finally, make sure that the stimulus measures one, and only one, knowledge item. Well-written choices should be about the same length, and be as short as possible. Don’t give clues to the correct choice by using keywords from the stimulus, and avoid grammatical cues such as asking for a singular answer and having plural distracters. And make sure that your distracters, while wrong, are still reasonable responses within the context of the question. After you’ve applied these guidelines to your items, make sure to have your items reviewed by someone else. In addition to simple things like spelling and grammar, the reviewer should check for accuracy, readability and interpretability. In the next couple of installments in this series, we’ll critique some poorly written items and figure out how they could be written better. Did you miss part 1 of this series? Click here for my first post, which focuses on the importance of making test items fair, valid and reliable.